Hello all, we have been working around the clock with a variety of different projects, but we just got this short video back from our friends at Karmakaze Productions and wanted to share it with you as quickly as we could. This video is a tour through a large residential system that Green Phoenix Farms recently designed and built in Austin, Texas. This system will hopefully prove to people that it is possible to have an aquaponic system that is designed to be both highly functional and possess a high aesthetic value. This system is a hybrid system that uses a 275-gallon IBC tote (food-grade) as the fish tank vessel. 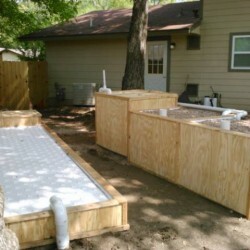 The water then overflows into a pair of 4’x4′ media beds that are filled with crushed granite. These beds are regulated by use of an auto-siphon, and from the media beds, the water flows to a Raft (or DWC) Trough that measures 4’x18′. This trough uses the new production rafts developed by CleverPonics – these rafts allow for 36 plants to be grown in a 2’x4′ space! This DOUBLES the production possible per square foot of DWC trough. From the trough, the water will flow into a buried sump tank, where the water is then pumped back up to the Fish Tank. Please leave a comment with your thoughts and let us know what questions you have about this system or anything else related to Aquaponics. Davey Griffis, Vice President Texas Grown Organics Inc. Awesome system that is one of the best designs I’ve seen. I really like the use of gravity in your system. Did you have to do anything special to the Autosiphons to get enough water to make it back up into the raft system? Where did you get the cleverponics rafts? I can’t seem to find that company online..
We are a retailer for them. They do not have an internet presence, as of yet at least. We also sell the Beaver Plastics rafts in the 18, 28 and 36 hole configurations. Email us at info (at) greenphoeixfarms.com for more information.